In 2006, the Sanitation Districts embarked on a comprehensive planning effort called The Clearwater Program. The objective was to create a Master Facilities Plan (MFP) for the Joint Outfall System (JOS), a regional wastewater management system serving 5 million people in 73 cities and unincorporated areas of Los Angeles County. The MFP evaluated the Sanitation Districts&apos; infrastructure and facilities through the year 2050. Based on these evaluations, the MFP made recommendations on how to best meet the growing needs of the JOS, while maintaining a reliable and cost-effective wastewater management system that increases the use of recycled water. The MFP&apos;s primary recommendation was construction of a new onshore tunnel to convey treated water from the Joint Water Pollution Control Plant in Carson to the existing ocean outfalls on the Palos Verdes Peninsula. The two existing tunnels are 60 and 80 years old and cannot be taken out of service for inspection and repair because they must continuously carry flow. These tunnels are not built to current seismic standards, yet they cross two earthquake faults. The MFP evaluated 22 potential tunnel alignments that would minimize the following: earthquake fault crossings, number of right-of-way procurements, and tunnel length. After screening these proposed alignments using criteria such as environmental impacts and cost-effectiveness, four feasible alignments were identified. These four alignments are shown in the figure below. To ensure community input in the planning process, the Sanitation Districts conducted over 500 public outreach meetings between 2006 and 2012. As a result of these efforts, the new tunnel will be constructed almost entirely under streets and other public right-of-way. No new ocean outfall will be constructed. 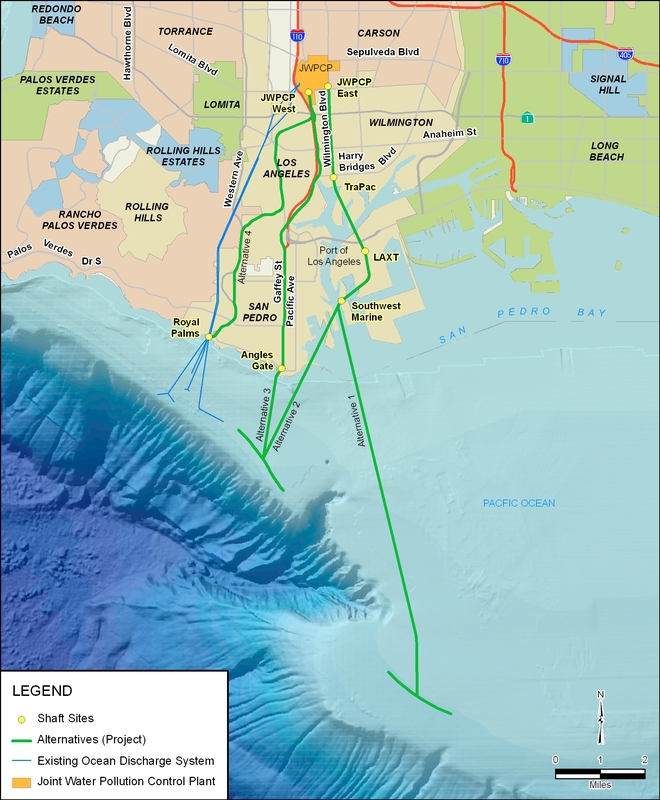 In November 2012, the Sanitation Districts Board of Directors approved the Clearwater Project and the tunnel aligment with the least environmental impacts. As part of the project, the Sanitation Districts hired Parsons Corporation and McMillen Jacobs Associates, engineering firms with expertise in tunneling, to assist with the tunnel design. To support the design process, Fugro Consultants Inc. was hired to conduct a thorough geotechnical investigation, and soil borings were drilled along the entire tunnel alignment. Concurrently, the Sanitation Districts met with various entities along the tunnel alignment where easements were required, such as the City of Los Angeles and the County of Los Angeles. The Clearwater Program MFP and its associated Environmental Impact Report/Environmental Impact Statement (EIR/EIS) were finalized in 2012 and can be found at the links below. The recommended alternative is Alternative 4.